The Regent Parrot will occasionally nest in holes in vertical riverbanks. P.a. anthopeplus: Male-bright yellow head, underparts and rump; dusky olive mantle and upper back; dusky olive inner scapulars washed variously with black; black outer scapulars and tertial feathers; lower tertials washed with red; yellow patch on folded wing; red inner secondary coverts tipped with yellow; black tail, tipped finely on undersides of side tail feathers with yellow/white. Bill orange/red. Eye orange. Female-yellow/olive head and underparts; dull yellow wing patch; wing patch smaller in size; lower tertials and inner secondary coverts pink/red; upper tail dull olive, the side tail feathers widely tipped and margined with red/pink on inner webs. Eye brown/orange. P.a. westralis: Male-differs from anthopeplus in that head and underparts are duller olive/yellow. Female-as in anthopeplus, but more olive, less yellow on head and underparts; less dull yellow on lesser and median wing coverts. P.a. anthopeplus: As in adult female. Bill orange/yellow. Eye dark brown. Contact call is described as prolonged and rolling; harsher than call of Superb Parrot. Also emits a quiet twittering after landing. Feeds in silence. Walk-in enclosure, minimum length 7m (23 ft). Small seed mix such as: canary, millet, and smaller amounts of oats, buckwheat, safflower and a little hemp; limited sunflower seed; spray millet; green leaves such as: Swiss chard, lettuce, sowthistle, dandelion, chickweed; seeding grasses; rearing food made from hard-boiled egg, wholegrain bread and carrot, all ground to crumbly consistency; fruits such as: apple, pear, orange, banana; complete pellet. Provide bird-safe, non-sprayed branches such as fir, pine, elder and willow; also provide flowering branches. Diagonal nestbox, 7" x 7" x 24" (17.8cm x 17.8cm x 61cm). P.a. anthopeplus is endangered. The clearance of mallee scrub, road kills, the taking over of nesting hollows by honeybees and Galahs and human interference are considered to be threats. P.a. anthopeplus: Inland SE Australia, near middle of Murray and lower Darling Rivers and corresponding tributaries in far SE New South Wales and NW Victoria to nearby E South Australia. P.a. westralis: SW Australia, north to Lake Moore district and east to eastern Goldfields, Balladonia district, and Israelite Bay. Found in riparian river redgum habitats, mallee scrub areas, box woodland with cypress pine, orchards and vineyards. In the west this species is found in Acacia and Eucalyptus woodland. Feeds on grass seeds, herbs, fruits, berries, buds and flowers. Cereal crops and nuts from orchards may also be taken. Birds disperse over large area after breeding season. Outside of breeding birds are found in boisterous flocks of a hundred or more, but are generally wary of humans. Feeds mainly on the ground. 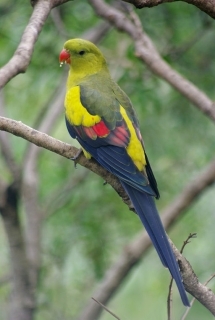 Research: Do feral honey bees and Regent Parrots compete for nest sites?